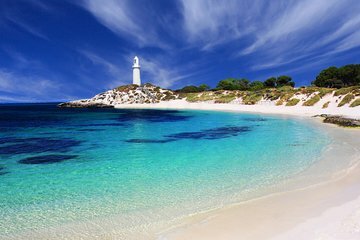 Din Rottnest Island ferge avgår fra enten Perth eller Fremantle, avhengig av alternativ valgt ved bestilling. Hvis du reiser fra Perth, vil du krysse nedover elven Swan gjennom byen for å komme til Fremantle, hvorfra det er en 25-minutters tur over havet til Rotto, som det er kjent for lokalbefolkningen. På slutten av hele dagen på øya, gå tilbake til Fremantle eller Perth på returfergen. Ferry left on time. Booking was easy. Bike riding and snorkeling was fun. Beaches were spectacular. Staff on ferry and island were very friendly. Very comfortable ferry trip and lots to do on Rottnest. Well worth a day's trip - the hop on hop off bus is a great way to see the island. Leaving from Perth allows us to see the city from the river. The commentary provided was good and the trip passed without delays. The ferry is comfortable even with some swell outside the harbour. The island is a must see when visiting Perth. it was mentioned that e-voucher is accepted but i was not sure was the e-voucher equivalent to e-ticket. emailed viator but had no reply. Very beautiful beach. My friend and I went riding and snorkeling on Rottenest. Very great experience. One of the best days of our lives !!! The ferry staff were very friendly and accommodating. My friends and I had fun cycling around the island to explore different corners of this amazing island and taking pictures of the breathtaking scenic views of the island. We also had fun playing with the quokkas! It was a very unique experience for all of us!! Fabulous white sand beaches to see and all were deserted. Hired a tandem to travel around island. Saw plenty of cute qokkas.